Perfect for contemporary and transitional spaces, this fixture is sure to provide the warm and illumination you need for a bathroom space. This handsome two-light wall sconce design features a warm tiger bronze finish over a steel frame. A slightly arching rod is attached to a rectangular backplate for a dash of visual intrigue. 16" wide x 12" high. Extends 6 1/2" from the wall. 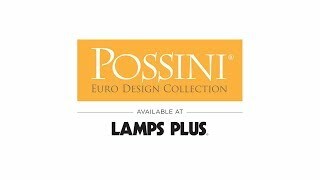 Two-light bath light from the Kalina collection by Possini Euro Design®. Tiger bronze finish over steel construction. Clear glass shades. BEST ANSWER: The back plate measures 7"W x 4 1/2"H.
BEST ANSWER: Hi - Unfortunately, this is not offered in any other finishes. can the light be reversed and lights face down? BEST ANSWER: Hi - Yes, this can be mounted with the lights facing downwards as well. Gorgeous finishes and dynamic geometric shapes create a beautiful design element in this three-light bronze and brushed brass glass bath light.